As i am new in CQ5 world,I am not much able to uinderstand this indexing rebuilding purpose.Can you elaborate more plz. Its Really helpful and I am referring this for quick and fast info. A colleague of mine referred me to this page. I had to build up the index again for the author-instance after my W7 system crashed while going to sleep mode. Thanks for help. The combined size of the /crx-quickstart/repository/shared/journal and /crx-quickstart/repository/repository/index is around 18GB. Do you have an approximate value for the time it will take for re-indexing? It might take between 2-4 hour to index that. It also depend upon memory assigned to JVM and machine config. What are the properties normally we configure under oak:index for the search indexing in AEM 6.0 ? how to verify if the re-index is complete ? For previous version of CQ you need to check log to see of re indexing is complete. 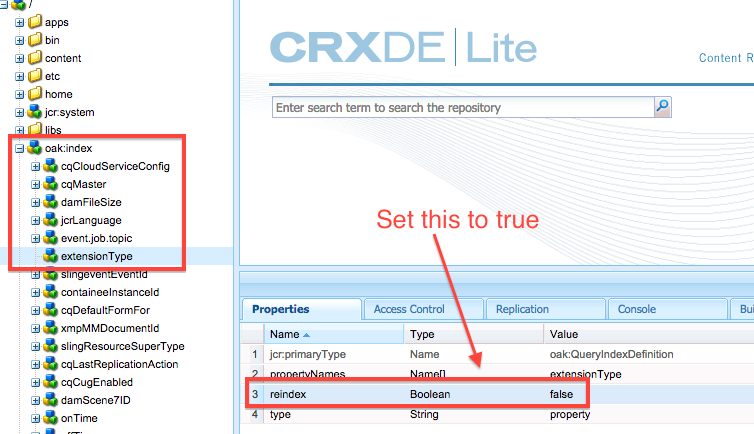 Also CQ instance will not come up unless index creation is done. Foe AEM 6.1 system will not go down but you still have to check log to see if reindexing is done. Also in AEM 6.1 make sure that you read https://docs.adobe.com/docs/en/aem/6-0/deploy/upgrade/queries-and-indexing.html before reindexing.